Well I had not consciously included Glasgow as one of my pilgrimage destinations, but in truth it is definitely a place with significance for me. For one thing it is the home town of my father, who I barely knew. And of course I’ve always known this but sort of avoided the fact, and the city. I almost certainly have family here that I’ve never met. Any “Who do you think you are” researchers reading this? If you’ve been following my progress in this homeless pilgrimage you will recall that I planned to spend some time sleeping on the street at some point. So arriving in Glasgow on Tuesday I was considering this idea. I even spent more than half an hour sitting in a doorway with my backpack, until I was verbally abused in my quiet reverie by a callow youth. “You’re taking the piss” is what he accused me of. Which as far as I’m aware I was not doing in the least. Merely minding my business and thinking about my options. There you have it: anti homeless prejudice without even bedding down. It was not this alone that helped me decide, but it did add to my sense of unease about finding somewhere to kip in a city I barely know. I spent an hour at Glasgow City Mission when it opened at 8.00pm, which was great. Lovely chats with some of the guests there, who were all friendly, helpful and courteous to a fault. Much better company than the aggressive youth of earlier in the evening! And I had a good chat also with Joe, their resettlement worker, I enquired casually about shelters, sort of saying that I could give a donation, and he spotted me for what I was right away: someone who was not strictly homeless, and with resources. And quite rightly he directed me to the tourist hostels, saying that unless I was homeless and with a Glasgow connection – I did not launch into the family connection story at this point, of course – I was out of luck. Part of me exulted at this. A good man, responding to a backpacker with courtesy and good advice. So at this point I realised I actually did need to find somewhere to sleep,. Glasgow was not as crowded as Edinburgh, through which I had passed earlier in the day, and which was exploding with Fringe people and street performances. But worryingly the first hostel at which I enquired was full, probably – they thought – with people who hadn’t found anywhere to stay in Edinburgh. Thankfully, and this is another example of God’s provision to me, there was room at the Youth Hostel. Which is great by the way. So yesterday I did the tourist thing, after a fashion. I’ve taken some photos to upload at some point. I spent the morning at the Cathedral, which is magnificent. 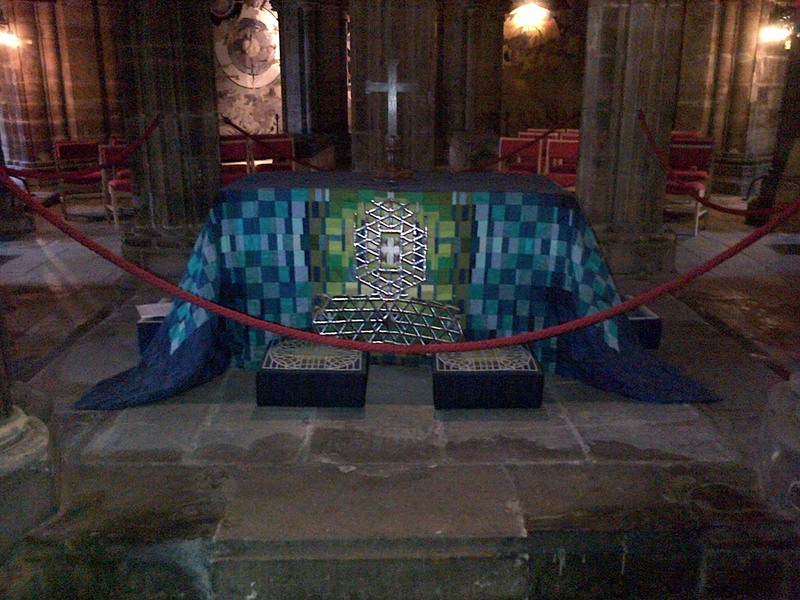 I was particularly moved at the tomb / shrine of Kentigern or St Mungo, which has been a pilgrimage destination for centuries, and is the reason that the Cathedral and the city are where they are. The motto on the city’s coat of arms: “Let Glasgow flourish by the preaching of thy word” is attributed to St Mungo. And of course St Mungo’s is a well-known name in the field of homelessness, having been started by a Glaswegian who was one of Anton Wallich Clifford’s colleagues in the early days of the Simon Community. I also visited the Necropolis. which is extraordinary. A city for the dead, with accommodation better than for many of the living. A hymn of Victorian grandeur and affluence. The People’s Palace was also well worth a visit, particularly as it devoted significant space to the role of housing in the history of the city – from the prosperity and order of the 18th Century, through the famously overcrowded tenements in the Gorbals, through to a temporary exhibition on the Red Road Estate and its impending demolition. And I’ve been thinking about Dad and my lost family connections with this place. And yes I have raised a glass of whiskey to him and my Scots roots. He emigrated to South Africa after he and my Mum divorced, and started another family. We met up a couple of times when he came over to this country before he died, but I have practically no childhood recollection of him. I’ll spend another day here before starting on the West Highland Way, and on to Iona.